Kuwadzana family recounts horror attack. 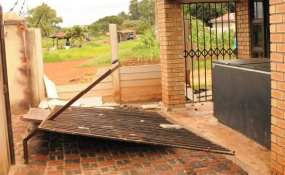 A Kuwadzana 5 family is counting loses after property worth thousands of dollars after gun totting 'people dressed in army uniforms' pelted their home with stones during last week's bloody and violent protests. Unconfirmed reports indicate that the violence has since claimed 12 lives while hundreds others were brutally assaulted by alleged soldiers and plain clothed persons. This is the deadliest attack since the post-election violence that claimed six people in August last year when soldiers went on rampage shooting aimlessly at protesters in the central business district. Precious Manenji, is one of the people who are lucky to be alive and unharmed after her home was ransacked by more than 50 people who came in 12 trucks. She believes they are either Zanu-PF loyalists or soldiers in civilian clothes. She recalled the horror event to 263Chat. "I was asleep when one of my kids came screaming that there were people who were charging at the house. So I peeped through the window and I saw about 12 trucks which had people wearing masks, while others had painted faces and I couldn't even recognise who they were. "So the truck stopped at a very nearby bus stop and some people dropped down to ask for the house of (former MDC Councillor) Njanjeni. The young man who was asked told them he did not know the place and he was badly beaten. "Unfortunately, someone directed them to my house and that is when they all charged towards my place while throwing big stones," she recounted. Manenji said one of her kids who was outside the gate screamed and when she had just closed the door, the whole gate was brought down. In a Hollywood movie style, Manenji quickly grabbed her three year old twins and crawled from the dining room area to her main bedroom while ducking stones which were breaking through the windows and hitting the walls. "When they started throwing stones, I stood by the wall while covering one of kids, the other one was already in the other room. However, the other glasses which they were breaking were also coming to my child, who by now was lying down and risked being cut. "When I got to the bedroom, I tried to look through one of the windows to see what really was happening, I only saw the vehicles dotted around my place and in one of the vehicles, there was a soldier holding a gun and other police officers. "So after they were done with breaking down the windows and some parts of the roof, they called a man who was standing outside and thy forced him to chant an MDC slogan, after he was done, they abducted him and sped off," Manenji said. While some attackers were busy helping themselves to the house, other turned their focus to the cars which were parked outside the yard. "Some of the attackers started to destroy the cars which were parked outside, they broke windows and punctured tyres. And I lost three cars in the process while my neighbours' were also affected," she said. Although an immediate report to the police was made, she was told the her case would be attended more than 24 hours after as the authorities were only taking reports and not attending to them. Manenji's case is one of many that were witnessed during the week long shutdown. Army helicopters were also firing at demonstrators resulting in the injury of hundreds of civilians in Kuwadzana. In other parts of the city, AK-47-wielding security forces were rounding up activists, detaining religious leaders and 'abducting' others amid a fierce crackdown following widespread popular unrest. Many civilians across the country have been living in fear as reports of terror at the hands of the military continued unabated. In the aftermath of the shutdown, soldiers have been beating unarmed civilians and in most cases, breaking into their homes and force marching men and young men out of their homes.